​When I sit down to do research on the latest trends in design, I feel as though I am always seeing more of the same. Every kitchen has painted cabinets. More specifically, every kitchen has white painted cabinets. I have LOVED this trend for the most part. I have especially loved that it is now trending to paint your cabinet’s colors other than white which helps mix things up. However, as I have been working on creating a welcoming environment in my own home, I have found that all of my painted finishes lack warmth for everyday living. This is not just because I like a cooler color palette; I finally realized that what was missing was just the simplicity of wood. I had painted all of my wood and it made everything seem so unnatural. 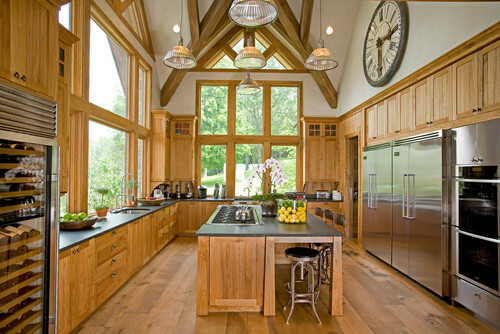 Why are natural wood cabinets not more popular? I don’t mean your traditional cherry or mahogany wood… or any of the other dark, warm, red toned woods that would not go with today’s trending need to be “light, bright, and airy.” I mean just plain and simple – leave it alone – natural wood. "It’s hard to believe, but the materials for your dream space had a life long before you. And it is that history that makes them perfect for your home. Before they took residence in your home, they lived in nature. And, in many ways, nature lived in them. This is evident in the grain of the wood, the pinholes, the knots, the burls and the eclectic coloration left behind by mineral deposits. If you look closely, you can read the story of their former life"
It’s a little bit of an oxymoron to me - we live in a society where everyone is so worried about putting natural products into our bodies and specifying natural materials that are good for the environment, but we like to paint every piece of wood we cut down. I do it too. In a way it is an incredible thing. It helps us to re-use old furniture instead of throwing it away or keep our old cabinets longer instead of ripping them out and getting new ones. I am only realizing that a painted finish seems to be the only way people want to go these days even in new construction, and I want to offer another option. I searched through Houzz.com to see what I could find as far as natural cabinets go. 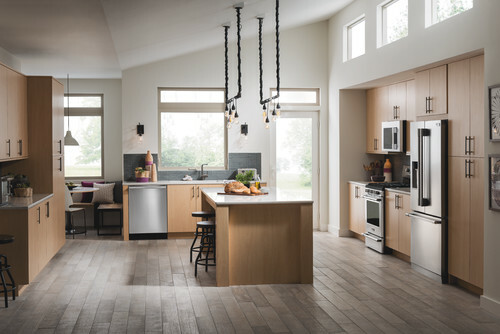 It was actually hard to find kitchens that looked updated with the natural finish, but I was able to find a few that helped to exemplify what I am excited about. I love the kitchen photographed to the left. The natural cabinet color adds warmth to this space while still being the “light, bright, and airy” look that everyone is going for. I can also see this going with a warm/cool color palette that can transition well through time. This photo below is a little bit more modern. The natural cabinets are paired with cooler colors which show that this finish can go either way. This is another thing I love about them – you can select different types of wood to get different temperatures. You could also mix in some painted cabinets with the natural finish. 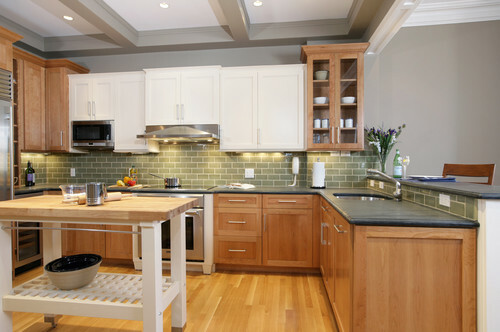 I love how this kitchen incorporates a few white cabinets with the green backsplash. It gives this space an organic look. I also love that this is paired with the gray walls – swoon. I'm afraid that some people are choosing painted cabinets in new construction because they think that is the only way to get the bright, beautiful kitchen that they want, but it is not. You should try something different - be unique. This last kitchen was featured in Coastal Living in 2011, but I had to throw this in here. I am in love with this look. Although it is a home on the Virginia coast, this could definitely be a kitchen in the farmhouse lover's home. Don't be afraid to step outside of the box. Some people hate the idea of natural cabinets and that is completely okay. I am only presenting the argument to try something new before just doing what is currently trending. Sometimes it’s fun to be different. You can still have a fabulous kitchen without having painted cabinets. For some reason, I have been very drawn to these natural cabinets lately and I can’t wait to help a client design a kitchen using them if you’ll let me!